This winter Somerset House is hosting a brand new exhibition celebrating the life and work of Italian couturier Valentino Garavani. Showcasing more than 130 of his haute couture gowns it will be the biggest UK retrospective dedicated to a man whose illustrious career has spanned over 50 years, and whose clientele includes a generous sprinkling of princesses, first ladies and Hollywood stars. 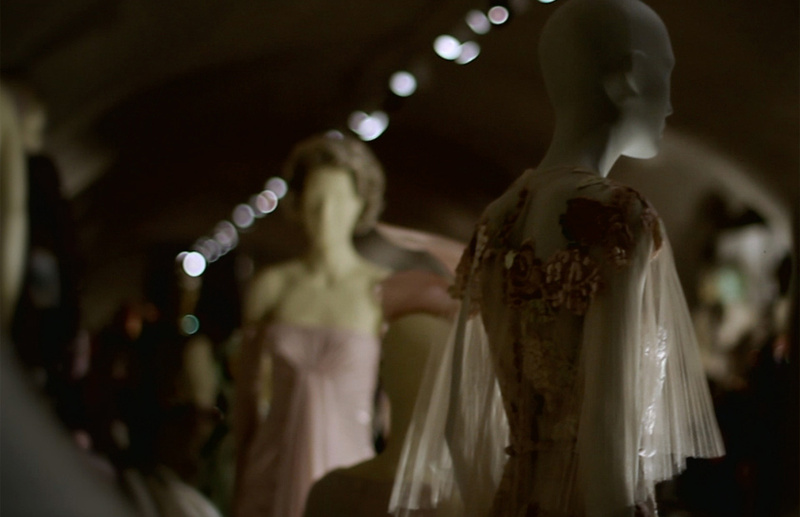 Valentino: Master of Couture offers the chance to marvel close range at the painstaking detail of couture dresses, discover what goes on in the ateliers and even experience a full-size catwalk, specially constructed for the event. Among the many highlights of the show is the black and white dress worn by Julia Roberts as she collected her Oscar in 2001 and Jackie Onassis’s wedding dress from 1968. Carefully conceived by international design duo, Kinmonth Monfreda, in collaboration with Valentino and Giancarlo Giammetti, the exhibition is composed of three main sections. The first room provides a fascinating insight into the designer’s world, featuring correspondence, couture show invites and rare photographs of the maestro at work and play. Next is The Catwalk. Both interactive and informative this dynamic part of the exhibition invites visitors to walk along 60m of runway while looking into an ‘audience’ of mannequins dressed in Valentino creations. Dresses, evening wear, miniskirts, capes, trouser suits and kaftans have been grouped together according to themes including monochrome, Valentino Red and volume. The only chronological aspect is the final group of dresses by today’s Valentino SpA design team. 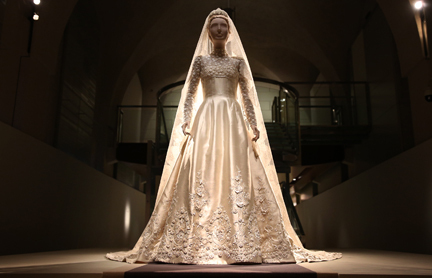 On descending the final set of stairs visitors will see the pearl-encrusted silk wedding gown, made with ten types of lace for the New York socialite Marie-Chantal Miller and her marriage to the Crown Prince Pavlos of Greece in 1995. 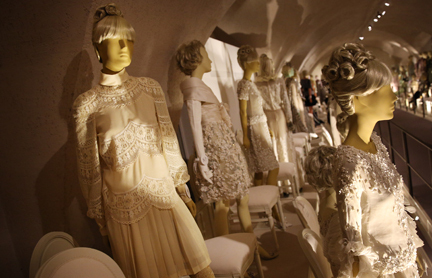 The exhibition concludes with rooms devoted to Valentino’s newest venture, the Valentino Garavani Virtual Museum, and behind-the-scenes films revealing the intricacy of the couture techniques required to craft a Valentino gown. Valentino Garavani, often known simply as Valentino, opened his first fashion house in Rome back in 1959. Together with his long-time business partner, Giancarlo Giammetti, he created an international brand name that soon became synonymous with elegance, femininity and sophistication. Today, in spite of having retired from the cut and thrust of fashion design, Valentino continues to work passionately on his own projects.